Are you having a love affair with coffee? I love the smell of coffee. I always have. Years before I liked drinking it, I wanted to pour it over my head every time I smelled that scrumptious aroma. Today, you can drive me up to a Starbucks® window and the instant coffee wafts past my nose, I feel my shoulders relax and my gut calm. I probably sigh out loud. I don’t know why coffee has such a strong effect on me or why it feels comforting. No one in my family regularly drank coffee. It took me years to learn to enjoy it. From 100% freeze-dried Taster’s Choice® instant to my current favorite, whole bean Jim’s Organic Sweet Love Blend, it’s been a journey. Like everything else, coffee drinkers have their preferences. A few years ago, I went to a presentation on coffee at the Gilcrease Museum. During the tasting portion, I learned I am not a coffee purist. I am not willing to spend a full two minutes pouring boiling water over barely ground beans roasted so lightly they taste like…well, let’s just say they’re not to my taste. 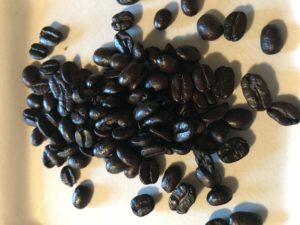 I understand that very dark roasts can mostly taste like charred beans, but for some people that can be as delicious as the charred edges of steak cooked on a charcoal grill. One local roaster promoted a particular coffee to me by touting its high acidity. The problem with that is, I prefer a very smooth mellow flavor. If high acid comes with a bite at the end, I don’t like it. Perhaps my favorite bag of coffee ever arrived from Costa Rica with a friend who had been traveling. Every drop I made from that bag superseded any coffee that came before or since. I’ve tried other Costa Rican coffees, but can’t seem to replicate that experience. For the past few months I’ve been on a quest to find a new satisfying roast. I had been grabbing less expensive, already ground bags until I realized the simple pleasure of a really delicious cup of joe can set the tone for my whole day. I want every day to be the best possible, so I had to begin with better ingredients. 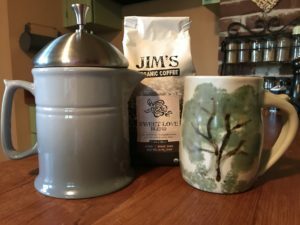 After experiments with several Starbucks, Peet’s, Wicked Joe, Equal Exchange, and Black Rifle flavors, I grabbed a bag of Jim’s Organic in a small health food store in my hometown. That one bag led to an online order that arrived this week. In addition to the Sweet Love Blend, I’m trying Costa Rican Hacienda La Amistad, Sumatra French Roast, and 2 Souls Dark Roast. They were all ordered as whole beans. Of course I couldn’t see the them online, but in the store I look for dark beans that glisten with aromatic oils. I grind the beans for about 15 seconds and place them in a ceramic French press. I’ve owned a variety of coffee brewing machines over the years including one that shot sparks into the room when I wasn’t even using it. None of them have lasted for more than a couple of years and none of them produced a better cup of coffee than a $7 glass French press purchased from a restaurant supply store. The ceramic press is a new purchase. So far, I like it. It keeps the coffee hot longer than my previous glass press. This press filled with Sweet Love Blend is good enough to extend my love affair with coffee. Given the popularity of frappumacchiatocino drinks, I sometimes wonder how many people enjoy the taste of coffee. All that sugary stuff inside or on top certainly masks its flavor. On the flip side, a little cream can make a moderately bad, bitter cup palatable. Perhaps previous experience with an unpleasant aftertaste leads to a cream & sugar habit. Then there are those who like coffee flavor, but want to fortify it as a breakfast substitute or an after workout replenisher. I have friends who swear by bullet coffee. It’s not my thing, but I recently saw a recipe for bullet coffee that looked delicious. In addition to butter, it included cacao, cinnamon, coconut oil, dates, and pink Himalayan sea salt. I’m pretty sure health benefits are not the final consideration for most dedicated coffee drinkers. How could they be? One week, coffee causes cancer and increases the risk of heart disease. The next week, the antioxidants prevent dementia, type II diabetes, and Parkinson’s and make us live longer. The research is conflicting at best. Recent research indicates that we need to figure out how long it takes our body to metabolize coffee to determine whether it will increase our mortality risk. And how exactly do we do that? Since there’s no way to know the exact risk or benefit, it seems like the best thing to do is listen to my body. Obviously, it’s good to feel calmed and comforted. It’s not good to consume so much caffeine that I feel jittery. A couple of large black cups in the morning and I am set for the day. On rare occasions, I might enjoy a cup with cream in the evening if I have dessert. More than that would be too much of a good thing. If I were to wax philosophical, I’m following the tenet that moderation is best in coffee as in all things…other than love. You can never have, or give, too much love!